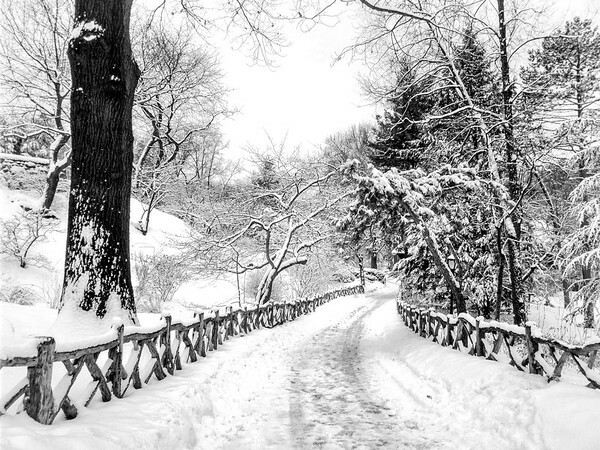 I think back to days spent wrapped in the cold silence of freshly fallen snow in Central Park. The labyrinth-like path leading from Shakespeare Garden lined by a wooden fence twists and turns in the snow winding its way under trees whose branches reach out to each other like eager arms awaiting the warmth of an embrace. It’s on days like this when the sun rests longer than usual and winter’s essence seeps through every crack and crevice that the earth quivers a ghost shiver that rests in summer’s memory. This photo was taken during a major snowstorm in New York City. The rustic wooden fence rests on a four acre section of Central Park known as the Shakespeare Garden which is located in the west part of the park near 79th Street. On the 300th anniversary of William Shakespeare's death in 1916, this area was dedicated to Shakespeare and named. The plants and flowers that are found in this area are all mentioned in the works of the playwright and are also plants and flowers that are found in his garden in Starford-upon-Avon. There is even a white mulberry tree on this four acre plot of land that is said to have grown from a graft of a tree planted by Shakespeare himself in the 1600s. While the paths that winds through Central Park's Shakespeare Garden is gorgeous in the warmer months of the year, it's absolutely stunning when snow has freshly fallen.